We are soon approaching the 100th anniversary of the passage of the Nineteenth Amendment granting equal voting rights for women in South Dakota. Help us to tell the story of the courageous suffragists who made votes for women possible. In 1919, when Congress passed the Nineteenth Amendment granting women the right to vote, suffragists throughout South Dakota and the Great Plains region had been hard at work for more than thirty years. With the help of early activists like Matilda Joslyn Gage, who toured Dakota Territory in the 1880s, and grass-roots organizers like Alice Alt Pickler of Faulkton and countless local workers, South Dakota achieved woman suffrage in 1918, a full two years before ratification of the Nineteenth Amendment in 1920. To celebrate the anniversaries of women gaining the right to vote, we have launched a statewide initiative that explores the generations-long fight for universal woman suffrage. Our goal is to raise $265,000 over the next two years to educate, promote, and share the history of women’s suffrage. Your support ensures that the history of this important movement will be widely disseminated. In 2018, the South Dakota Historical Society Press published Born Criminal: The Life of Rebel Suffragist Matilda Joslyn Gage. In 2019, the Press will publish an anthology concerning suffrage, Votes for Women on the Northern Great Plains, and in 2020, a highly illustrated children’s book, The Voice of Liberty, will feature the suffragist protests at the dedication of the Statue of Liberty. Fifty-one years before the ratification of the Nineteenth Amendment, the Territory of Wyoming became the first U.S. territory to grant woman suffrage (1869). New states and territories like Wyoming were willing to consider and grant women the vote, often in hopes of increasing their population. A few of Wyoming’s neighbors in the Northern Great Plains shortly followed suit, granting women full or partial voting rights through constitutional amendments or legislative action: Montana (1914), North Dakota (1917), and South Dakota (1918). 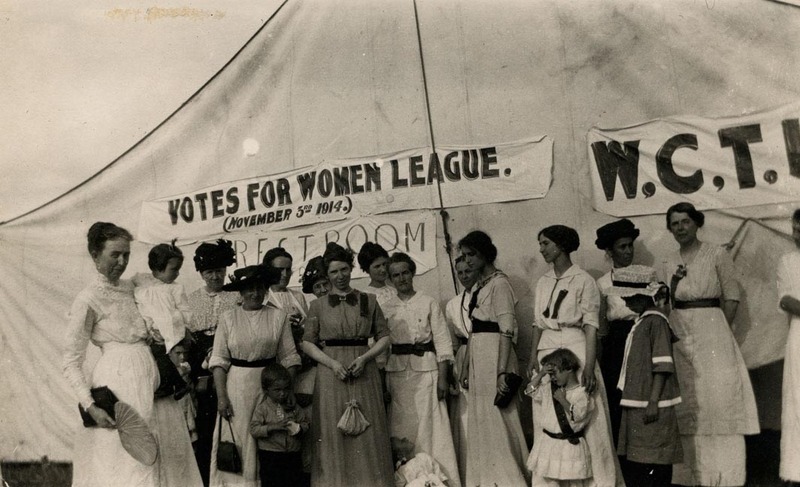 The history of these early suffrage successes has often gone untold. Historians Molly Rozum (University of South Dakota) and Laurie Lahlum (Minnesota State University—Mankato) are now in the process of compiling and editing an anthology of essays highlighting the suffrage movements of Wyoming, Montana, North Dakota, and South Dakota. Through the editors’ efforts, understudied champions of women’s rights on the Northern Great Plains will receive attention. In October 1886, suffragists Katherine Devereux Blake and Matilda Joslyn Gage joined Lillie Devereux Blake (Katherine’s mother and fellow suffragist) and the New York City Woman Suffrage Association to protest the dedication of the Statue of Liberty. “That statue is a woman, but she can’t speak for herself,” Lillie said. “I say, let’s give her a voice.” The women argued that the Statue of Liberty was the greatest hypocrisy of the nineteenth century. Liberty should not (could not!) be represented as a woman in a land where not a single woman had liberty. In her first picture book, Voice of Liberty author Angelica Shirley Carpenter centers on the actions and words of these three women as they, and others, board a filthy cattle barge and sail into the midst of the celebration. Waving their banners high, they find themselves front and center to the unveiling of one of the United States most important monuments. It is an exciting episode in the long struggle for woman suffrage in the United States, a moment in time worth remembering. For women in the United States prior to 1920, the struggle for voting rights was the cause of a lifetime. For Matilda Joslyn Gage (1826–1898), it was part of a lifelong struggle for equality a­nd social justice. Gage, a forgotten mother of the women's rights movement, was a contemporary of Elizabeth Cady Stanton and Susan B. Anthony. Together, the three of them founded the National Woman Suffrage Association. During the 1880s, when all four of Gage's children moved to Dakota Territory, Gage visited often and promoted the cause. Son-in-law, L. Frank Baum, newspaper owner in Aberdeen and later author of The Wonderful Wizard of Oz, supported Gage’s ideas and woman suffrage. In return, she provided Baum with his social-reform vision for the imaginary world of Oz. 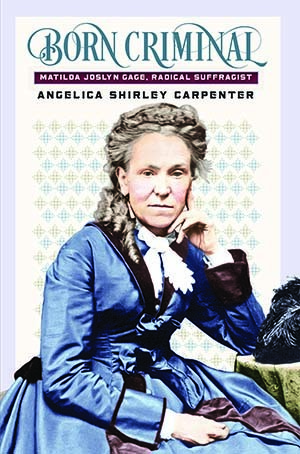 In documenting Gage’s rise and fall in the woman suffrage movement, biographer Angelica Shirley Carpenter carefully illuminates the impact of Gage’s legacy on modern women’s rights. Written for Young Adult readers, Born Criminal: Matilda Joslyn Gage, Radical Suffragist is the first full-length biography of Gage to be published. To purchase Born Criminal go to the Heritage Bookstore at www.sdhsf.org/store. The suffrage centennial commemoration exhibit will open November 2019 in the Observation Gallery. The exhibit will focus on individuals from South Dakota and across the country who were involved in the women’s suffrage movement, culminating in the 1920 national elections. Next year we will begin planning for an event in 2020 to celebrate the 100th anniversary of women’s suffrage. Funds raised at this event will ensure that the history of this important movement is widely disseminated and remembered by our next generations. Make your gift in your name, your company name, or in the name of a woman who has inspired or mentored you. We will recognize your gift in our annual report and on our websites. Promotion of the books will include both state and national components that highlight the contributions of these little-known women. Through activities, including author signings and symposiums, digital and print advertising, and social media (#radicalwomen), we will bring attention to the efforts of Great Plains women and their supporters. Please call (605) 773-6003 to learn more or indicate your level of support below. We appreciate your time and your consideration. Thank you for your help in fulfilling this mission. Yes! Women's Suffrage is important to me! I want to help make possible the publication and promotion of women's suffrage nationwide! Add your name or the name of a mentor or an inspiring woman in your life to be recognized online and in our annual report. of the 19th Amendment with a gift of $119.